See more objects with the color sienna darkkhaki rosybrown darkolivegreen darkkhaki or see all the colors for this object. This is a Teapot and lid. It was manufactured by Schramberger Majolikafabrik. It is dated ca. 1930 and we acquired it in 2001. Its medium is glazed earthenware. It is a part of the Product Design and Decorative Arts department. This tea service was designed by Eva Zeisel for the Schramburg ceramic factory in Germany. 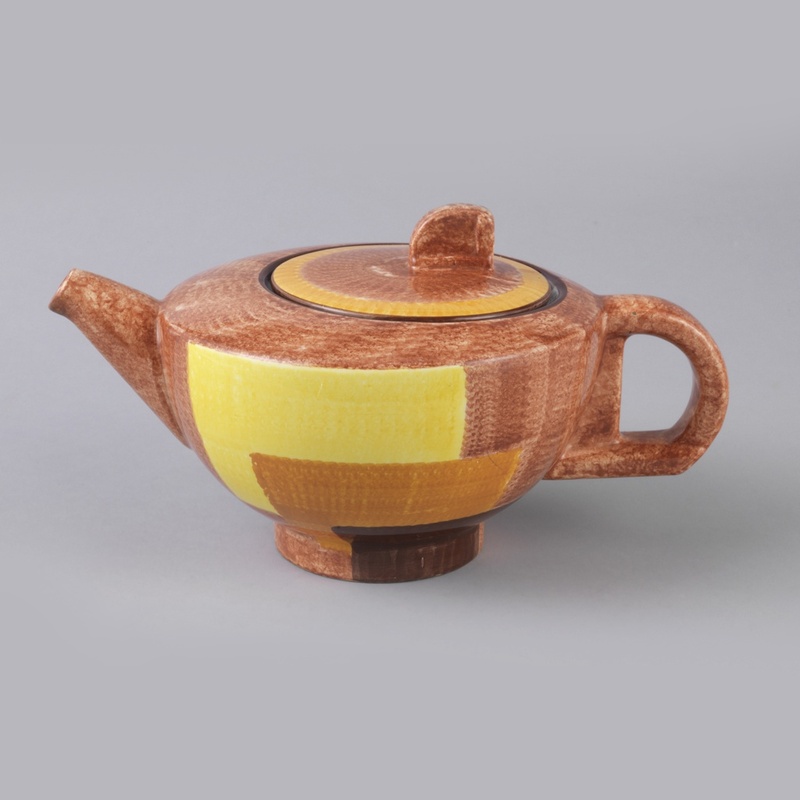 Zeisel was major figure in 20th-century industrial design, perhaps best known for her contributions to mid-20th century American modernist ceramics. Zeisel began her career as a potter in her native Hungary, and went to Germany to design mass-produced tableware for the Schramberg ceramics works from 1928–30. In 1931, she moved to the Soviet Union, where she worked at both the Lomonosov Porcelain Factory, the former imperial porcelain factory in Leningrad, and Dulevo, a large ceramics factory outside Moscow. In 1937, Zeisel settled in New York, where she taught ceramics as industrial design at Pratt Institute in Brooklyn and continued to bring a unique and playful variety of organic modernism to the ceramics, glass, metalwork, and furniture she designed well into the early 21st century. At Schramburg, Zeisel modeled shapes and designed surface decoration, favoring bright colors, odd geometric-shaped handles, and abstract patterns. This tea set is in excellent condition and would be a wonderful addition to our landmark collection of German Weimar ceramics. It also enables our collection to document Zeisel’s designs across the scope of her career, as we also have examples of her designs for the Lomonosov Porcelain Factory and her later American work. It is credited Gift of Torsten Bröhan. On underside of foot, stamped in black: "MAJOLIKA, SMF" [conjoined] in shield, "SCHRAMBERG Handgemalt 62"; faintly impressed: "3" [or 8?] "213".